The Chamber's automated SMS platform is the most complete text messaging solution. Why use SMS marketing? Because 90 percent of all texts are read within three minutes, you can ensure that your important messages, will be read promptly. It enables you to send mass SMS or individual alerts to the right people at the right time - all automatically. How you can use Text Messaging in Your Business? repair shop. Send out service specials to you VIP customers or new product announcements. Message everyone about special upcoming events or guest performers. You can even sort your customers based on their favorite music genre to send more relevant alerts and invites. Cultivate trust through the most reliable communication channel: SMS. With an array of engagement and security features, assure your clients are aware of special seminars, interest rates, or new services so they will stay informed no matter where they may be. Use our powerful engagement tools to simultaneously improve communications with prospects and customers and help them bolster sales in turn. Let your customers know about new services or procedures. You can also request yes/no responses should they be interested in setting an appointment or seeking additional information. Add texting to inform your business customers of special rates. Customers will appreciate not having to take the time to call, and your front desk won’t be constantly held up on the phone. Promote new services and communicate tips and advice more effectively with customers. With texting’s response rate 7.5x higher than email, you’ll see far more engagement than ever before. Ensure your clients are being reached by giving them the most popular communication channel - SMS. 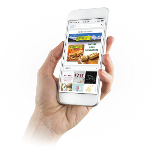 Send enticing digital coupons, set up a mobile loyalty program or provide useful tips and information. Keep donors up-to-date on how your operations are going and invite them to special events. Organize your field canvassers and volunteers based on where they live, so you can rally your troops whenever you need them. Use texting to streamline processes in your business like property advertising, maintenance requests, and critical alerts. Collect house-hunters' phone numbers based on their interests, and alert them when a matching property is listed or having an open house. Stay connected with your congregation. You can text inspirational passages to lift spirits and send event alerts to ensure attendance. Fill empty tables with a picture message containing your monthly specials, alert customers to special promotions and run a mobile loyalty program to reward your regulars. Drive traffic through your doors with enticing digital coupons delivered via SMS. Also, create a customizable mobile rewards program to keep customers coming back for more. Alert parents/students about school closures before they even walk out the doors. Send a text on the day of an important game to boost school spirit. Also, send important reminders or policy changes. Recruit more qualified candidates, keep in touch with current clients and candidates about new job openings, interview tips through the most reliable form of communication. Chambers of Commerce are about helping businesses prosper and helping communities thrive! A Shop local program encourages residents to shop and buy local, which improves the local economy by providing more local jobs and supports city services like police, fire-medical, parks and street maintenance. ​Chambers have a fervently-held belief that the health of the business community and the health of the larger community in which it lives, are inseparable. Shop Local programs are a cost effective, business retention and expansion strategy.